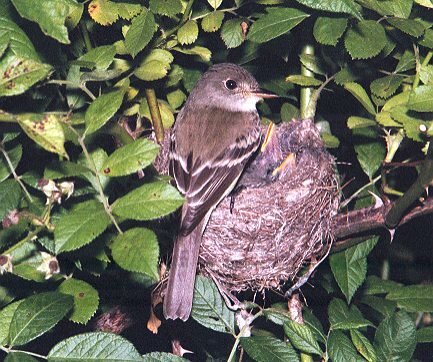 In 2006, an Eastern wood-pewee nest was found in multiflora rose intertwined in an 8' shrub along Cattail branch, within 20 feet of the bank. The nest was small and well-concealed and found only by watching the adults for sometime. Like typical flycatchers, pewees spend much of their time perched high on branches of large trees, from which they dart out to catch flying insects. 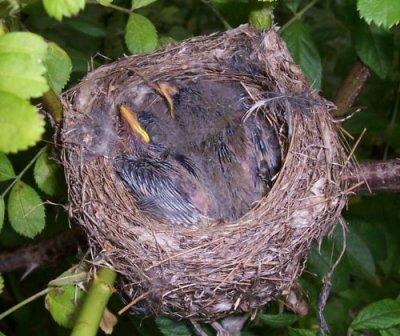 Their frequent visits to the vicinity of this small shrub is what led me to the nest. 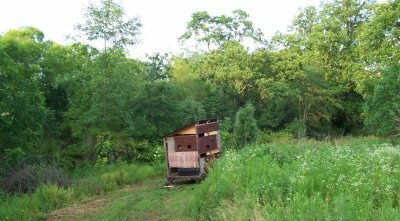 The trailer blind was positioned to observe both the pewee nest and a simultaneous nesting of a catbird nearby. However, observation records and dates were not kept. Also, video was not recorded since I wasn't yet prepared to record at a remote location. This year, 2007, I plan to use a car battery to record anywhere on our property. 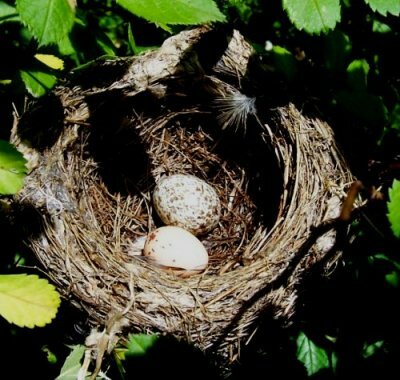 The nest was discovered with one cowbird egg and one pewee egg. 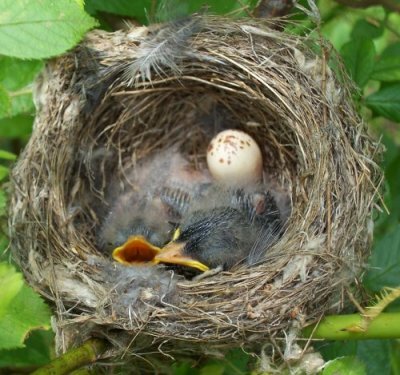 Possibly, a second pewee egg had been pitched by the cowbird. At the next visit, one cowbird egg and three pewee eggs were present. 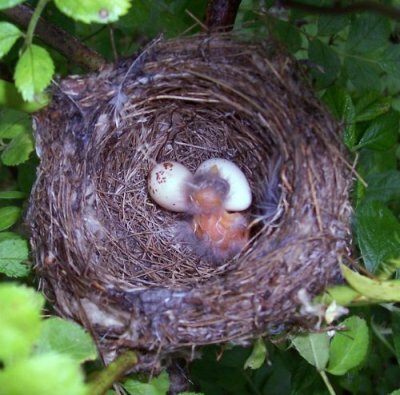 The average clutch of the pewee is only three eggs, so it is likely that the cowbird didn't previously pitch an egg. 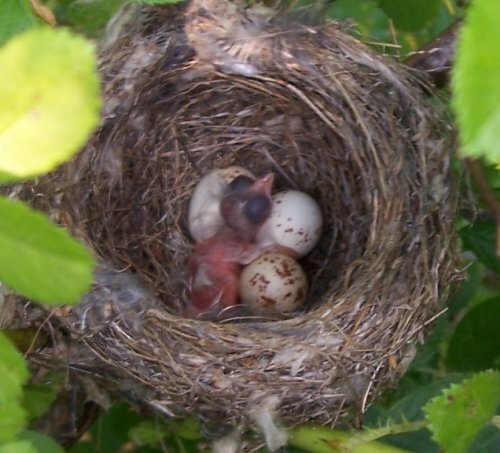 On my third visit, the cowbird egg had hatched and the three pewee eggs remained. 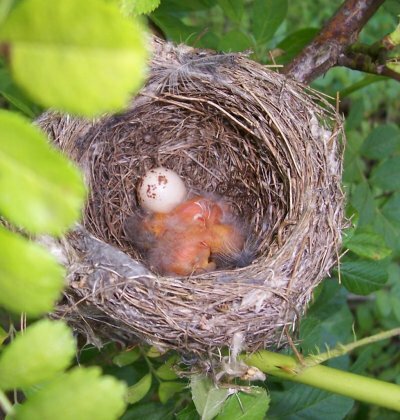 The cowbird nestling was removed by a human who wanted to observe a normal pewee nesting. 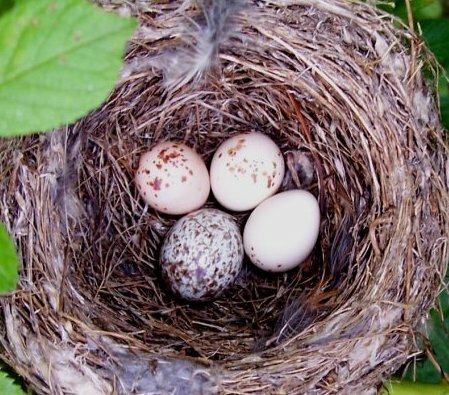 Eastern wood-pewees are not known to eject cowbird eggs and are thought to be infrequent cowbird hosts. 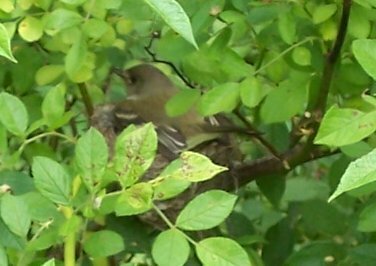 Perhaps the location of this nest, only three feet high in a shrub, attracted the female cowbird’s attention, as it did mine. 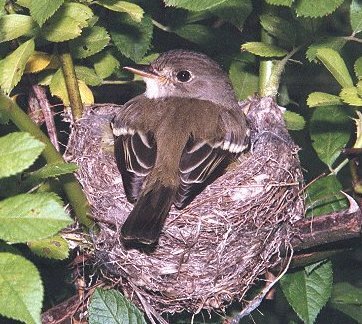 Pewee nests are usually much higher in a tree and built on a horizontal limb. However, both adults could almost always be seen near the nest during my brief stints in the blind. I didn’t witness any confrontations with other species in the immediate vicinity of the nest. Catbirds were feeding young 12’ away in an equally low nest, with no apparent interactions between the two species. 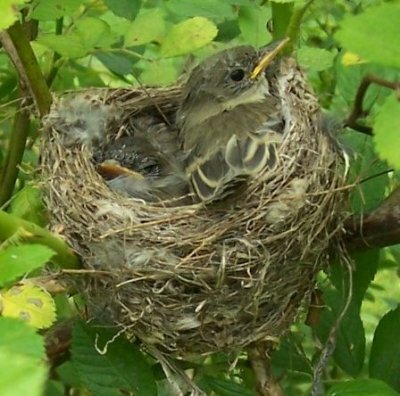 On my next visit, the first pewee egg had hatched and later that day or the next, the second egg hatched. The third egg never hatched, leaving the two nestlings to quickly crowd the small nest. Early in the nestling phase, the female would remain on the nest brooding unless I approached within 10 feet or so. When I would enter the blind, she would soon return to the nest. The male also seemed rather indifferent to my presence as long as I stayed a few feet away from the nest. After the two young fledged, they were observed high on a limb of an ash tree overlooking the creek, being fed by the adults. 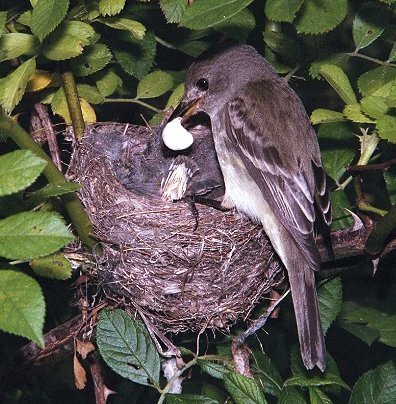 The Eastern Wood-Pewee is one of the many species showing a consistent decline in population over its nesting area, according to BBS data. 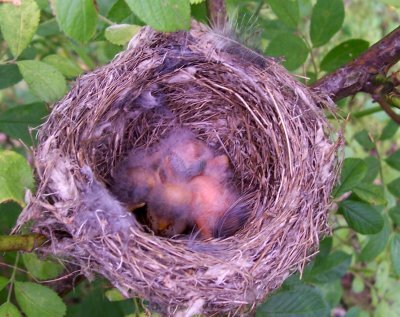 Possible causes suggested are loss of habitat, brown headed cowbird nest parasitism and use of pesticides. It would have been interesting to have observed this pewee nest when the cowbird egg was laid. Were the pewees away from the nest area? Or did they harass the cowbird who still succeeded in laying anyway? Hopefully, I will someday catch on video the pre-dawn egg laying of a female cowbird in a host nest. The trailer blind at the pewee nest site. The nest is about 20 feet to the left of the blind. Eastern wood pewee nest with one brown headed cowbird egg and one pewee egg. 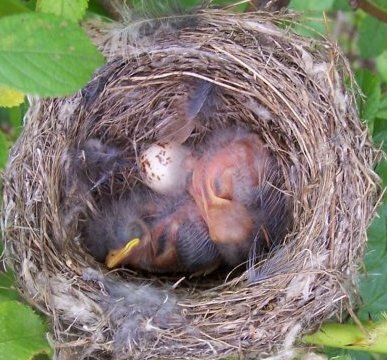 Two Eastern wood pewee nestlings and one infertile egg.